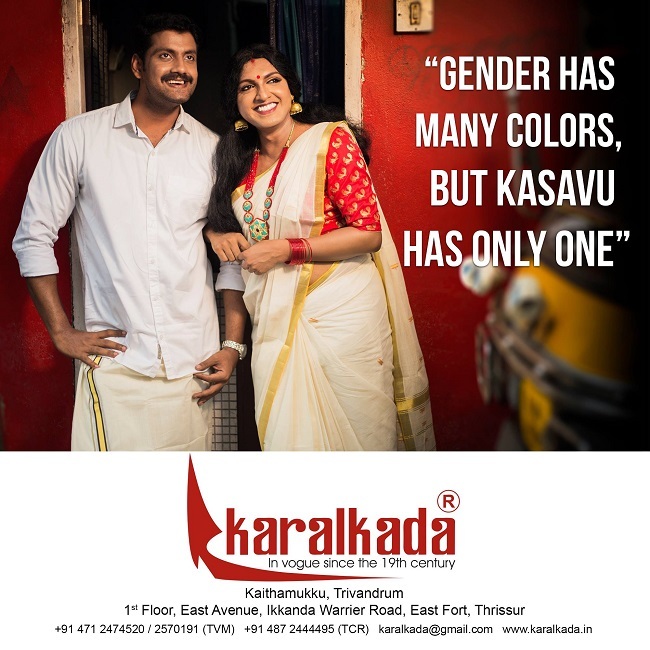 Transwoman model Gowri Savithri has been featured in one of the three advertisement hoardings of the textile brand Karalkada. For 33-year-old Gowri Savithri, a transgender model from Kerala's Kottayam district, a call from an ad production agency offering to cast her in an advertisement of a popular textile brand came as a pleasant surprise. Gowri had created waves of change two years ago, after modelling along with another transgender person for designer Sharmila Nair’s collection of sarees called Mazhavillu (rainbow). Although the pictures grabbed national and international headlines, it failed to generate a sustained conversation about employing transgender people in the modelling industry, Gowri points out. But now, a huge hoarding of Gowri and a male model Mathai, stands tall in the Thrissur Swaraj round, thanks to Karalkada, a pioneer textile brand in the state. Karalkada, that was opened in Thiruvananthapuram in 1855, opened its store in Thrissur last year. The hoarding has the tagline: "Gender has many colours, but kasavu has only one." This is one of the three hoardings part of Karalkada's new ad campaign designed by DocArt productions. While one of the hoardings feature a grandmother, the other features an old man. Speaking to TNM about their latest advertising campaign, Deepa, manager of Karalkada who looks into customer relations and marketing, says that they did not want to stick to conventional norms while doing an ad. "We have a set of loyal customers, who trust us as a brand. We wanted to bring a change to the set patterns of beauty...who can be a model, and the like. As a traditional brand, it is easier for us to communicate to our customers; they would be more receptive when we take up something. We know how many from the transgender community are looked down upon. So when the ad company suggested this idea, I didn't have any doubts in my mind. In fact, it is not like we gave a transgender model an opportunity to be featured here, but it is more like a privilege for us too," Deepa explains. She says that although Karalkada is a traditional brand, they hardly had any reservations while coming up with the campaign. The ad campaign has been designed by DocArt productions, a company rolled out by designer Sharmila and a Calcutta-based filmmaker Ratheesh. For Sharmila, Karalkada was an established brand that was open to supporting the transgender community. "Karalkada didn't want a conventional ad at all. And so when I pitched this idea to Deepa, she received it quite well and said we could go ahead with it," Sharmila says. While she had personally come across difficulties while shooting for her own brand of sarees two years ago, Sharmila says that people are now more accepting of the transgender community. "Two years ago, when I was looking for a location to shoot for my series of sarees featuring trans models Gowri and Maya, we faced so many difficulties. People would just stare at them and make them uncomfortable. But this time around, it was different. While people were curious to know what was happening, they did not make Gowri uncomfortable. That way, we as a society, has improved," Sharmila says. Unfortunately, finding a male co-model to feature alongside Gowri was not an easy task for DocArt productions. "We got in touch with many agencies and spoke to many models, but they were all scared and apprehensive when we said they will be featured alongside a transgender model. Some were worried about how their families will react, some were scared of being stereotyped and no amount of convincing helped. Finally, I got in touch with Mathai, who has acted in a popular short film. He readily agreed and took it very positively," Sharmila says.